According to The Loyalty Effect by Harvard Business School Press: “It costs 5 to 10 times as much to win a new customer as it does to keep a customer, and a 5% increase in customer loyalty can translate into a 75% increase in profitability.” And one of the easiest ways to increase your profitability is to sell more to your existing customers. There is a great pressure on banks to increase revenues and decrease costs – which makes the optimization of every marketing contact critical. Apart from trying to get new customers on board, one of the steadiest sources of new business and related revenue is to reach out to current customers for additional business. It is also a proven fact that the more connected a customer is to your bank, the longer they will stay with you. A study showed that on an average, a customer using one product will stay with a bank for 18 months while a customer using three products will stay seven years – almost 5 times longer! So how does one do this? Selling to an existing customer is not the same as selling a product to a new lead. Here you do not have to establish your credibility – you need data about the customer so you can engage with him meaningfully. It is important to take advantage of every customer touch point to show them that you value them and can offer something that would be of help to them. When you know what your customers have bought earlier and offer something relevant to that, they will see it as good customer care and not as an intrusive sales call! A complete picture of the customer with information about all of his relationship links with you will help maximising the value of an organisation’s most valuable assets – its customers. As one can see, the case for selling to the existing customers of a bank is an easy one. The problem comes when it comes to executing it. Data and Analytics underlie most of today’s cross-sell or upsell techniques. Models built on Predictive Analytics have made possible offers that are just right, just in time. Trends and populating models that are the backbone predictive analytics have been found by Data Mining and Analytics. Value analytics is yet another approach. Every customer touch point – be it the call centre, the branch, the web – leverage analytics in some fashion in order to address a range of customer needs – and not just what he is currently looking for. Many challenges prevent the use of Analytics to revolutionise this. There is a lack of domain knowledge and data analysis. A banker might not be able to analyse or interpret the all the data that is generated by the analytics platform. A data analyst may be able to compile the statistics quickly, but he needs wait on the business user’s domain expertise to organize and analyse it. Only then can it be taken to the realm of actionable decisions. All this takes time. All the statistical modelling depends on the data that is fed into it. It takes accurate data with the least possible approximations. But the reality is that banks have a lot of dirty data – data that can be inaccurate and even inconsistent. Research tells us that only 37% of customers believe that banks understand their needs and preferences adequately! Less than 20 percent of banks analyse a customer’s share of wallet – which is the percentage of all the financial products that he holds. Which only goes to show that all the massive amounts of customer data that is available, has not be tapped! Collecting customer data happens for a reason – to understand your customer better. Banks need to use this information to offer the most suitable help by way of products, services and offers. Use every bit of information that is available – transaction behaviour, existing accounts, lifestyle factors and demographics – and then segment them into groups based on the most-likely cross-sell opportunities. Did you know that 66% percent of customers of a certain bank felt that the communication they got was ‘general’ and not at all personalized? And 53% said that they got an offer for a product that they already owned! Customers are evolved now – they know and expect more. The staff at your branches with direct contact with your customer are your front line in your cross-selling strategy. They meet them every now and then and each time they do, they can find out about their needs and then offer suitable solutions. The staff needs to be trained and empowered to do this well. Offer packages – when a bundle of three or more products/services is offered and accepted by a customer, it builds sticky customer relationships. 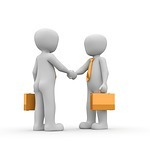 The customer needs to see the value of accepting an offer like that – only then will you derive any value from it! Customers want value. It could be anything – anything from financial benefits or convenience features to any other factor that he sees as an advantage. Something that he sees as his gain in this business transaction. Every offer must answer the customer’s number one concern: “What’s in it for me?” Ask him for referrals and reward him for successful conversions. The easiest products to market are those that help a customer use an account they already own. It could be a debit card or online banking, or direct deposits, bill pay, automatic savings transfer, personal line of credit and security solutions such as privacy protection. These kind of services will also ensure that he will use the products that he currently owns more frequently. It is important to stay connected with the customer constantly. Not just when you welcome him on board or want to sell him something. And instead of selling him an isolated product, find products and services that would be useful to him. Analyse all his transactions, the products that he owns and even his behaviour patterns, to see what is likely to be his next purchase. The goal is to offer the right product, at the right time, to the right customer through the right channel. Do this proactively. Don’t wait for him to ask you about a product. It is all about studying a customer’s behaviour and offering him products and services that he will find value in. And only when he finds value there, would the bank be able to see value as well.